Cost Effective, Supper Reliable TS Server. Combined DVB-ASI Player & Recorder Device. Ideal "Install & Forget" TS Server for 24/7 care free operation. Ideal solution for all applications. When connected to a PC/Laptop, the AT140USB operates just like a standard DVB-ASI TS player & recorder. In stand alone mode of operation, the AT140USB does not need a PC. 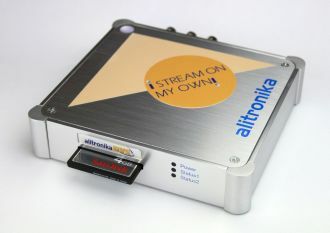 Transport Streams could be played back from or recorded onto the ON-BOARD Compact Flash Memory device. A Micro-Processsor operating on embedded software, does the job of the PC/Laptop. How does it all work ? When Playing or Recording Transport Stream using Alitronika's devices, hardly any processing power is needed. This is due to the fact that Alitronika's devices are real hardware based devices so the hardware carries out all the functions. This is in contrast to devices supplied by others vendors, often re-branded devices with addition of their application software. By adding the extra processing power needed, the AT140USB is capable of playing back any TS files of up to 50Mb/s. The TS files for play back could be recorder on the Compact Flash device in 3 ways, by connecting a DVB-ASI stream to DVB-ASI input of AT140USB, using DVSStation3, Alitronika's FREE application software, or simply by placing the Compact Flash device in any Flash Reader Port of a PC/Laptop and just copying the files onto it. Windows XP, Vista & Windows7 ( 64bit ) Drivers + SDK & Linux Drivers. Supports 188 & 204 byte or Arbitrary Packet Sizes. Automatic Cable Equalization of up to 350m. Supports True or Inverted ASI signals. Sync, Error & Code Violation Detection. PCR Time stamping by Hardware. Can play Higher Bitrate then the TS file. Can output True and Inverted signals. Supports Burst Mode, RAW Data Mode. Null packet insertion by Hardware. Packet time and date correction. Hardware Generated Null Packet or Counter Packet. Universal Interface for Digital Video or MPEG-II Transport Stream Recording, Playing and Processing. High Speed Serial Data Link. Transport Stream & color bars suitable for both Broadcast & Digital Signage. Input Return Loss: >15 dB. Connected to PC/Laptop: 0 to 214 Mbit/s. Stand alone mode: 0 to 50Mbit/s.